For many, the Memorial Day weekend is a time for fun, food and family gatherings, but for more than 200 injured Veterans and their supporters, it's the conclusion of the annual Ride 2 Recovery Memorial Challenge. The week long, 350 mile rehabilitative bicycle ride began in Arlington, Va. and ended in Virginia Beach, Va.
Cyclists began their journey in Pentagon City and rode through Virginia, with an overnight stays in Manassas, Fredericksburg, Glen Allen and Williamsburg. 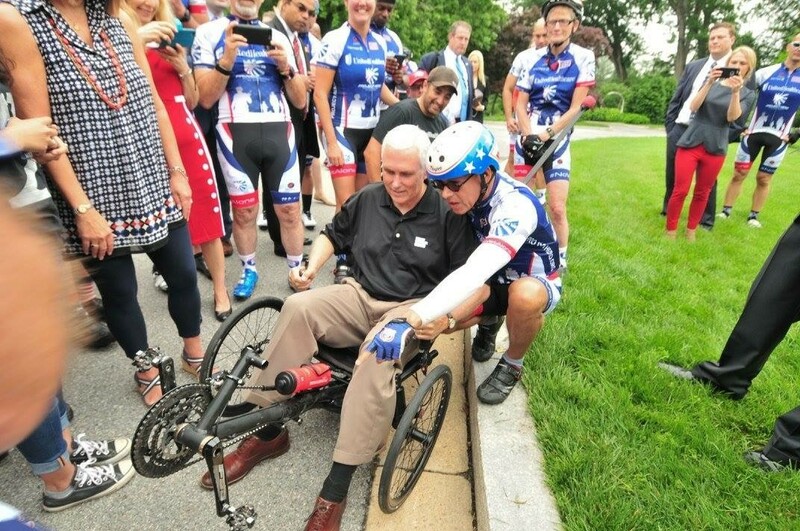 The cycling team from Fort Stewart, Ga. met Vice President Mike Pence along with the Governor of Virginia; Terry McAuliffe and the Mayors of Virginia Beach, Richmond, Manassas and Fredericksburg. Sgt. 1st Class Joseph Henao participated for the first time in this year's ride. After injuring his knee while deployed, he began cycling as a therapeutic outlet. "Adaptive sports such as cycling helped me through a really rough period. The knee injury restricted a lot of activities for me. This allows me to rebuild my strength while limiting the amount of pressure on my knee," Henao said. "It feels good to participate with my fellow Soldiers. It's all for a good cause, it's about adjusting and finding a new way to enjoy the things you love and that's what adaptive sports will do for you." The Ride 2 to Recovery Program supports physical and psychological rehabilitation for injured Veterans, featuring cycling as the core activity. From indoor spinning training at military installations, to long-distance rides, the program helps injured Veterans heal though the challenge of cycling long distances, using hand cycles, recumbents, tandems and traditional road bikes. Buddy Karolev, Adaptive Reconditioning Coordinator at the Fort Stewart Warrior Transition Battalion says that the challenge provides tremendous value to Soldiers and their families. "Many times when Soldiers come to the WTB to heal, they feel as if they will never have an active lifestyle again and that's simply not true. I've seen many Soldiers thrive after becoming involved in adaptive reconditioning sports, it's literally a life line for many." he said. This is the 10th annual Ride 2 Recovery memorial bicycle challenge.